Posted on Sun, Apr 1, 2012 : 5:41 a.m. The question “What’s new?” has particular meaning for the St. Lawrence String Quartet, set to perform at Rackham Auditorium Thursday, in the second of two University Musical Society appearances this season. The four players—violinists Geoff Nutall and Scott St. John; violist Lesley Robertson; and cellist Christopher Costanza (the sole non-Canadian in the group)—were here recently to play John Adams “Absolute Jest” with the San Francisco Symphony. Adams is but one of the many important contemporary composers whose works the quartet has premiered and played. And the SLSQ’s upcoming concert here features other contemporary works. One is a piece by R. Murray Schafer—“the dean of Canadian composers,” cellist Costanza calls him—a natural for a group with strong Canadian roots (even if it is in residence at Stanford University). Among Schafer’s catalog of 11 string quartets, it’s the third, from 1981—a highly theatrical work, with entrances and exits for the players and scripted vocalizations—that the quartet has favored most and that they reprise here. The quartet has had a fruitful, but much more limited relationship with the other contemporary work on Thursday’s bill, not for want of liking it, but for want of having it: the music for “Kohelet,” by renowned Argentinean composer Osvaldo Golijov, came in more slowly than anticipated. Who: Chamber ensemble presented by the University Musical Society. What: Music by Haydn, Schafer and Golijov. When: Thursday, April 5, 7:30 p.m.
How much: $22-$46, UMS Ticket Office in the Michigan League, 734-764-2538, and online at ums.org. The SLSQ is no stranger to Golijov—they have worked with him since the early 1990s, and they netted two Grammy nominations for their 2002 recording of his “Yiddishbbuk,” a work they performed extensively again last season. That the music for “Kohelet,” based on the book of Ecclesiastes, has come in slowly has not dimmed the SLSQ’s enthusiasm for either Golijov or the piece. 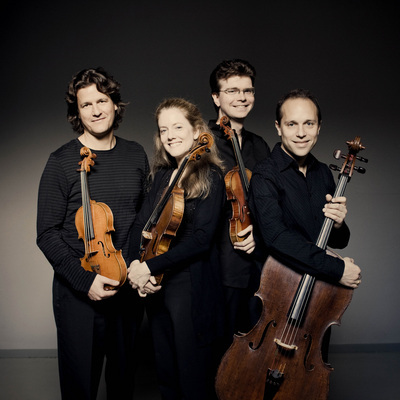 Bookending the Schafer and Golijov works are two Haydn quartets, Op. 74, No.1 and Op. 76, No. 2. Written, of course, more than two centuries ago, they are safely in the hands of the SLSQ. The innovation here is using Haydn as closer, not just as an opener.